I found this story and felt compelled to write it. Thanks to both Josh and Karen for hosting this fabulous challenge. Congrats to Karen for passing your certification test! Woot! Walking hurriedly, William Pope makes his way to the bridge, his tall, athletic frame bent over to combat the rain and snow pelting him. Bud Clark, mayor of Portland, glances out of his apartment window, on his way out the door and freezes. “Life is just too hard. I’m done,” says Will under his breath as he reaches the midway point, hops onto the railing, and jumps. Bud watches in horror, incapable to do anything but witness it. Bonnie, arriving at her office, stops with a jerk when she sees the body lying in the middle of the road, blood pouring from his ears. The fences may be ugly, and people hate them, but since 2013, not a single suicide has occured. I landed on this story quite by accident, looking for inspiration for this Pegman destination. Here I was thinking I’d be writing about the music or foodie scene. So much for that! 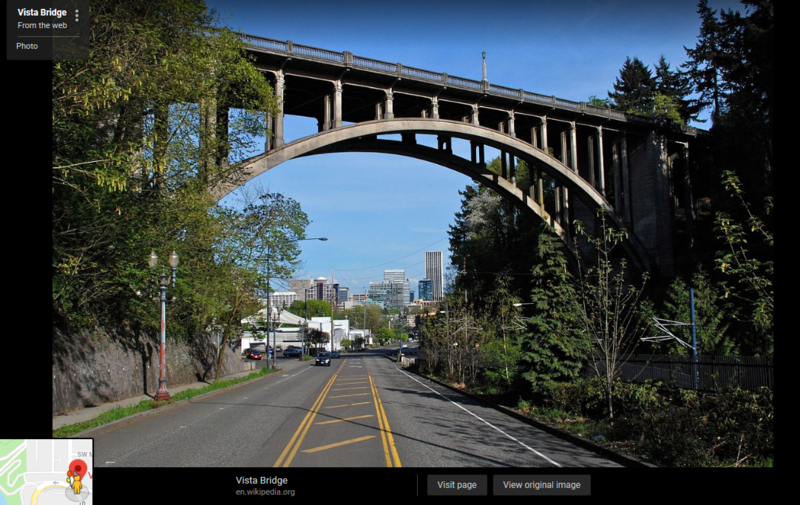 This bridge was called “Suicide Bridge”, as there was an average of two leaps per year since its official opening on Dec. 6, 1926. To read more about it, click here.